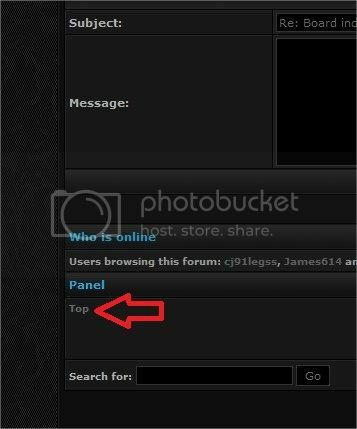 Just a thought, Why not have an option to click the board index at the bottom of the forum as well? Probably would be a cool option on the forum, I know I would like it. I agree, I would like to see the board index at the bottom as well. I don't know however whether it requires a hack or modifying the templates (most likely will). Due to how phpBB software works, anytime you upgrade the software it requires reapplying any hacks or modifications you do, so we've tried to keep those to a minium (ie. zero) to minimize the work associated with on-going maintenance. I'll run this by Dave since he's the one that updates the forum software and see what he says. I would think it should be as simple as modifying the template. Should be able to just add a code in the bottom of the template above the "who is online" section. I look forward to the option, thanks for entertaining the idea! I'm pretty sure the 'Top' feature at the bottom avoided having to scroll up manually. Didn't work for me though..
Hmm I've never notice that "top" button. Its way down there in no mans land and it doesn't seem to do anything. Most forums use the 'Top' feature, if you go over to nasioc or legacygt it works just the same and what I notice is that it adds '#top' behind the url thread that you're currently viewing. When I hover over the top feature here it has '#wrapcentre' behind the url. So if I add #top to url while not being at the top the function works...This may be bad coding and why it doesnt work. I don't see the top button either. Which forum "skin" are you using? I talked with Dave and he said it was a good idea and he was going to look into it when he next updates the phpBB software. The "Top" button is very small and inconspicuous. And it's a clickable text link rather than an actual button. Same here....no top link for me either. Guess the mods aren't cool enough to have the non functioning Top option. Sorry....I couldn't help but remember that quote from your post.